Do you remember being a teenager or even a tween girl? At school. Those friendships? Those girls? Those troubles? I do. And now as I see mine and other friends’ kids get older, I’m seeing these issues all over again. Female friendships can be amazing – but they can also be not-so-amazing, can’t they? Especially at school. They can be fraught. They can be mean. They can be nothing like we want them to be, and that can be hard. 5. You don’t need a best friend; you need to be your own best friend. I think this is true for all us – young or old. However, when we’re young, we often get sold the line of wanting or needing a best friend. Someone who is always there for you. Someone who stands by you. Someone who knows you. The only problem is that when you’re young and not sure of yourself, it can be difficult to be that person for someone else. So we can get let down by our best friends and we can let down others. So I don’t think we necessarily need one ‘bestie’ or ‘BFF’. We can have a range of friends – and we can also be our own best friend. 4. Other people’s behavior is about them and not about you. This is such an important one. We can take so much so personally, can’t we? We think someone is dissing us because we’re not cool. But no, they are dissing us because they don’t feel good enough about themselves. They’re trying to make themselves feel better. They don’t feel confident about who they are so they are bitchy about others. They exclude others to make themselves feel more special. We can’t interpret other people’s behaviour as always being about us. It is more likely to be about them. 3. Your feelings are about you and not about other people. This one is equally important. If you feel upset or frustrated or angry or hurt that is telling you something about yourself. Yes, the trigger may have been someone else’s behaviour or being in a particular situation, but that other person or situation didn’t necessarily make you feel that way. We all make interpretations of what’s happening in our world, and that influences how we feel. Someone might diss us, but we don’t take any notice. We don’t care. But someone else might diss us and we feel incredibly hurt. What’s the difference? We’ve made a judgement. We’ve made a choice to ignore one person’s opinion of us, but fully own someone else’s. We have choices. 2.We can be kind anyway. When we are feeling dissed or excluded it can be hard. Absolutely. But we can be kind anyway to that person and more importantly, to ourselves. Because when you’re a tween or teenager and you’re not sure of yourself, you can make mistakes. Others can be mean or fake or un-thinking, but we don’t necessarily want retaliation – more meanness, fakery or thoughtlessness. Instead, we can try to be kind, have a big heart, and forgive. That doesn’t mean we have to be ‘besties’ or even remain friends with mean girls. But we can be understanding, which makes for a better overall vibe amongst the girl collective. 1. Having a bigger world than just your school friendships makes for a healthier life. School can feel like a fish-bowl. A hot house. And if friendships aren’t going well at school, we can feel our whole world crumbling. So that’s why it helps to have a life that’s bigger than school. Other activities. Other relationships. Other friends. People who aren’t at school who we can relate to and hang out with. 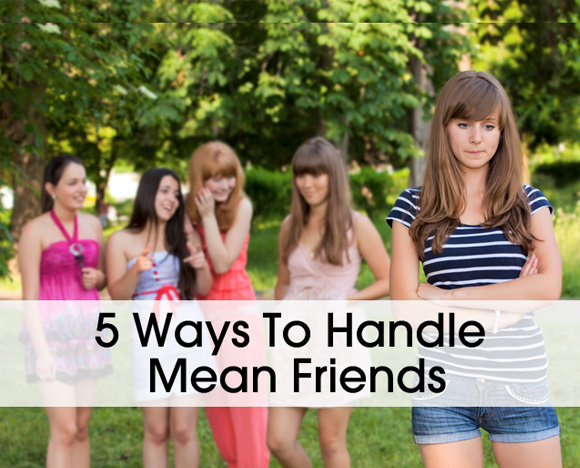 A bigger world means we won’t get caught in the school friend vortex quite as much. We can dip in and out. Not all of these ideas are easy. But they can be practiced. And they can make a difference. What else would you want to teach girls about friendship? Jodie Benveniste is a psychologist, parenting author, TEDx speaker, and author of four parenting books, including Intuitive Parenting: Unlocking the secrets to raising incredible kids. Visit her website at jodiebeveniste.com.